The great period of Spanish letters is the Siglo de Oro, Golden Age, which begins in the year 1543 with the posthumous publication of a book of poetry by two Spaniards, the Catalan Juan Boscán and his co-author, Garcisalo de la Vega, of Castile. The poems are strongly permeated with Italian influences and thus open great new vistas to the Spanish muse. The Golden Age in literature came to an end in 1681, a century and a half later, with the death of the last great dramatist of the classic theatre, Calderón de la Barca. Previous to this period, and not to be forgotten, is the Celestina, written in 1499. In any case, the Golden Age represents a beautiful flowering of the Spanish mind and heart which continues long after the decline of Spain’s political supremacy. The original form of the literature of Spain is the ballads, or popular couplets (coplas see chapter 5) which are unparalleled in any country. However, just at the time that the Catholic Council of Trent was in session (1545-1563), at which the Church of Rome took a good look at herself and determined to clean house, there appeared the first and the best Spanish picaresque novel, Lazarillo de Tormes, 1554. The unknown author of this slender, powerful shocking book makes a complete about-face from the pastoral and chivalric novels, and revels in giving us a photograph of Spanish society as seen through the eyes of a shrewd young pícaro or rogue, who goes from job to job and master to master, finding cruelty, avarice and opportunism on all sides. Even the church is rigorously satirized in two of these figures, hence an explanation of the anonymity of the book. The only character who emerges with dignity from this mélange is the poor squire, who, despite his poverty, is as proud as Lucifer, and has no heart to hurt any man. He is the epitome of a good part of the nation, the embodiment of personal dignity, poverty, and pride, the prophetic symbol of Spain’s hunger and her emptiness of material things. Spain was not really that bad in 1554. The author of Lazarillo is foretelling what his country will be like in another hundred years. After the turn of the century several other picaresque novels appeared, and the Spanish pícaro became one of the well-known figures of world literature. By 1600, the pícaro, in his various forms, was beginning to swarm on the streets of the cities of Spain: soldiers without jobs, many of them crippled, who had returned from Italy or Flanders; run-down lesser noblemen whose patrimony had been squandered; vagabonds and beggars of all description who, unable to get to America, were at least determined not to make an honest living with their hands; countrymen who had poured into the cities and found no jobs; workers thrown into the streets when the national economy spluttered and then cracked; hangers-on milling about hoping to get into the government bureaucracy, etc. The Church, unintentionally, encouraged this parasitic attitude with its Jesuitical emphasis on faith rather than works as the way to salvation. The picaresque novel, therefore, was a very human protest, the expression of the Spaniard’s existential anguish, a vision of the self in conflict as the world and reality went gliding by. Is it any wonder that other writers of the Golden Age should seek an escape from this reality? In the poetry of the religious mystics they found it. Mysticism represents the martial spirit reduced to a religion struggle. The mystics were knights-errant of the soul. Outside of their religious zeal, they led lives of action. They were hard workers and honest reformers. But their search of God was a flight from reality in which the individual soul fought to find union with the divine absolute. Their escape was the greatest that man has ever accomplished on this earth, their poetry some of the most impassioned. They represent a distillation of medieval faith despite the rapid but often awkward progress of the Renaissance. Santa Teresa (1515-1582) became a nun, a Carmelite in Ávila. She mortified her body with fasting penances, extensive prayers, and a general disregard for physical wellbeing. She suffered from fainting spells, violent headaches, vomiting, extreme nervous tension, and finally, after a series of convulsions, she went into a cataleptic state and was pronounced dead. Later on, she woke up, ate and drank and told her experiences while in the trance. Saint Teresa spoke of receiving direct communication from God through “the ears of the soul”. She wrote many books and poems, and led an exemplary life, which made her tremendously admired in Spain, where her following was (and is) widespread. Another type of Golden Age literature was the highly embellished baroque world of the great genius Góngora, which was an exaltation of reality. His poetry had little in common with the sentimental and lucidly bucolic quavering of the pastoral poets, but, via the difficult metaphor, the accumulation of long streams of images, Góngora recreated the entire world in terms of his own acute poetic fancy. Góngora was of the belief that if things are called by their common names, their reality ends at the very moment. If they are given another name which exalts, ennobles and embellishes them, this is their bid for immortality. The purpose of the poet is to follow this process to its finale. Whether or not we agree with Góngora’s results, whether or not we are irritated by the abstruse complexity of his imagery, we must admit that he has been able to create a unique poetic world, one in which sensitive spirits of many tongues will find inspiration for generations to come. The most famous Spanish writer of all time, Cervantes, was a contemporary of Góngora. He was not born into such an exalted family, yet was himself one of the lesser hidalgos of his country. His early education in Álcala and later in Madrid placed him in contact with the Erasmist and humanistic currents of the Spanish Renaissance, and this liberalizing influence is very apparent in his masterpiece Don Quixote, first part published in 1605, second part in 1615, one year before his death. Cervantes travelled and worked in Italy, fought at the battle of Lepanto against the Turks, where he was severely wounded and lost the use of his left hand. On his way back to Spain he was captured by pirates and was enslaved by them for five years before he was ransomed. Back in Spain, he tried to make a living by writing, and produced several plays and other pieces which enjoyed a moderate success. On several occasions he was put in jail, probably for debts that he could not pay. He was in prison in Seville when he began to write the Quixote. This novel in many ways parallels the author’s life. His hero is a man in the fifties, who spent most of his life knocking about the world, being invariably defeated, but always rebounding with optimism; a man that has read voluminously, turning his head away from practical things and unable to concentrate on the prosaic job of earning a living; in a nutshell, a defeated idealist, a dreamer of great literary works, but the producer of none. The reason Cervantes gives for writing the Quixote is that he wishes to laugh away the ridiculous romances of chivalry. But as the action progresses, it becomes perfectly plain that the two main characters (Don Quixote and his squire Sancho Panza) have grown in the heart of Cervantes, and his initial wish fades away into that greater catharsis-creation of his immortal portrait of human nature. 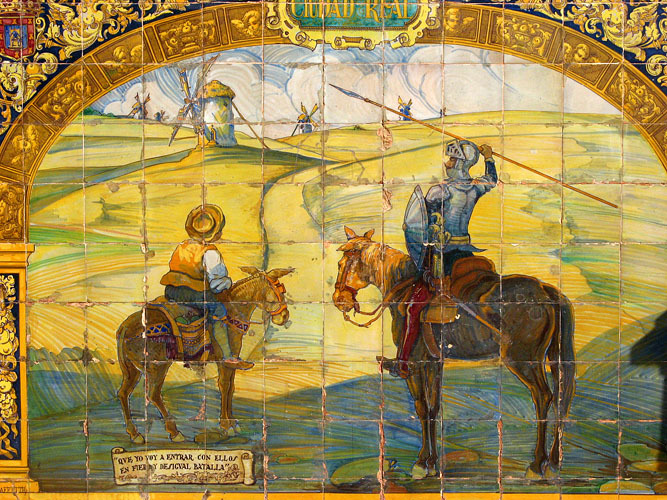 Sancho Panza represents the reality of the senses and of the moment, and Don Quixote symbolizes the wider reality of human belief. Each fights for his position, and each both wins and loses because of interpenetration by the ideas and character of the other. The entire novel is a treatment of human character, truth and justice. Contemporaneous with Cervantes was the birth and early development of the national theatre in Spain. Lope de Vega (1562-1635) was its principal creator. He was undoubtedly the world’s most prolific dramatist. He wrote between five hundred and six hundred full-length plays, many of them within a few tense hours. Over three hundred of these dramas survived, besides an impressive number of novels, stories, poems and shorter dramatic pieces of various descriptions. The Spanish comedia (Golden Age drama, not merely comedy), as delineated by Lope became a true popular theatre, and Spain’s dramatists were kept inordinately busy trying to satisfy the demands of the people. It was primarily a comedy of intrigue based on a few stereotyped situations and primary emotions: love, jealousy, honor and vengeance. This kind of theatre has often been called “cape and sword drama” because of the constant presence and importance of these two items in the resolution of the intrigue. It is easy to see that this combination of elements could give rise to a drama which might readily become artificial, as indeed was frequently the case. On the other hand, despite the accepted conventions and unavoidable restrictions imposed by public taste and the church, Spanish drama of the Golden Age did produce a considerable number of first-rate plays. Public demand and a set dramatic formula pushed Lope to use his fertile imagination and glib pen to the fullest extent, and he became the greatest improviser of literature the world has ever known. His facility in striking off verses was extraordinary. He also used a great number of folk coplas and proverbs, sprinkling these throughout his plays in many instances in order to give the entire production a popular flavor. Many of his plays are based on actual historic episodes or well-known legends. Lope was greatly loved by masses of theatergoers, and with their support, and sometimes following their insistence that he moves in a given direction in his dramas, he created the Spanish national theatre. He mirrored and carried forward the popular taste as no other Spanish author ever has. Lope traveled all over Spain and met all kinds of people. He made villains of many of the nobles, but never of the king. He stood always with the king and the common people against the corrupt nobility. Psychologically, this reflected what was taking place in Spain: The kings had sought to ally themselves with the masses and with the church in order to overcome the disruptive power of the nobility. Lope’s theatre pays repeated tribute to the just and honest king, and thus cements that symbol in the public mind and favor. Lope was the most admired of all Spanish writers during his lifetime. The nobility as well as the theatre-going masses knew and idolized him. He had two wives and several mistresses (a goodly numbered of which were married women), numerous children, no surviving descendants. He spent the last part of his life as a priest in the bosom of the church (as later did Calderón and Tirso), but his early years were anything but serene. When he died in 1635 at the age of seventy-three his funeral was one of princely magnificence. The obsequies lasted three days, and three bishops officiated in their pontifical robes. All theatres in Spain held ceremonies honoring the deceased idol. Lope de Vega had a host of followers in the Golden Age theatre: Fransisco Gómez de Quevedo y Villegas, Tirso de Molina, Ruiz de Alarcón, Guillén de Castro, Rojas Zorilla, Mira de Amescua, Moreto, Pérez de Montalban, and last of all Calderón de la Barca, who brings the great epoch to a close with his death in 1681. Quevedo (1580-1645) has sometimes been called the Spanish Voltaire. His mordant pen, steeped in satire, caricature, and bitter laughter, reveals an inglorious and frustrated Spain. The repulsiveness and vapidity of Spanish society, rotten at the core, is Quevedo’s main concern as an author. Quevedo does mock and laugh at these things, but his laughter is biting and ends in tears. He was also a great poet of love, death, and the passage of time, all joined in one fleeting requiem. Tirso de Molina (1571-1648), who did not begin to produce his plays until he was thirty-five, has left approximately one hundred fifty full-length dramas. Of these his play on the Don Juan theme, The Deceiver of Seville, 1630, is by all odds the best known. Based on a medieval legend of a great seducer of Seville, the story caught on and was imitates by authors in nearly every other European country. Mozart’s opera Don Giovanni, with its fine libretto by da Ponte, has kept the story alive and on the stage of every world city until the present day. Calderón de la Barca (1600-1681), so exalted by the German romantic writers, is, of all the dramatists of the Spanish Golden Age, the one who is best known outside of Spain. Calderón is the Baroque dramatist par excellence. He brought the Golden Age to its conclusion in a contorted blaze of words and symbols. He was the poet of Spanish Catholicism. Besides his longer plays Calderón was the author of numerous symbolic religious pieces of great poetic beauty. The Counter Reformation had by this time clamped down on all free thought in Spain, leaving room only for straight dogma plus endless embellishment. Character analysis and fundamental questioning are lacking in the dramas of the Golden Age. For us today most of the plays of Calderón have a pallid core. Only the beauty of their language saves them. In these days of the late Golden Age plays were frequently presented in one of the towns plazas. There were only two theatres in Madrid though. The players set up their performances in a plaza, in a dead-end street corner, or in an open space where two or three buildings formed a sheltered angle. These places were called corrales, or yards. The theatre boxes were the windows and balconies of the nearby buildings. The stage was simply an elevated platform a couple feet high made of planks placed on top of benches. A skimpy colored canvas at the back of the stage was the only scenery. One of the actors had to come out on the stage and describe the scene, if this was essential to the play. The performance always took place in the afternoon. There were no night performances. Sometimes there was a canopy to protect the audience from the hot sun, but if it rained heavily the performance had to be canceled. Dramas were hardly put on more than once. ; a week’s run was an exceptional record. Hence, Lope’s fertility was in part the result of public pressures, which demanded something new everyday. The plays were almost invariably accompanied by dances, and in the intermissions shorter skits were presented. Only two subjects were prohibited absolutely: criticism of the institution of Monarchy, and criticism of Catholic dogma. Within this limitation a remarkable variety of dramatic works were produced. El Greco was born around the year 1548, on the island of Crete. He went to Venice as a young man, and studied in the studios of the great Titian. About 1577 he arrived in Toledo, and spent the rest of his life there until his death in 1614. He painted most of his pictures for churches in the area. El Greco was undoubtedly a great painter. His paintings “in the style of Titian” attracted much attention during his early years in Spain, and were much sought after. But El Greco was anxious to develop his own unique talents, and he bent every effort toward this end. And what he did paint appeared to be vey popular, for churchmen vied for his services and paid him well, and he lived very comfortably until the day of his death. El Greco was followed by Velázquez (1599-1660), who for centuries was the most highly regarded of all Spanish painters. Velázquez was born in Seville, “of gentle blood”. The young man was given a fine education. His greatest predilection was for art and he drew feverishly from an early age. He went to Madrid when he was thirty-three; he spent many hours studying at the Prado Museum and at the Escorial. The young artist was called to the attention of the king, Philip IV, who became his patron for the remainder of his life. Some three dozens of Velázquez’s canvases are of the particularly not handsome king. Velázquez made two visits to Italy where he stayed more than two years. In his final period Velázquez painted the Meninas (Maids of Honor), that reveals a craftsmanship which has ever since been the admiration of all artists. Although Velázquez was one of the most masterly technicians of all times, it is to be noticed that he was lacking in the ability to capture the essence of human character, anguish, or longings. The third world-famous painter of Spain’s Golden Age was Esteban Murillo (1617-1682), who, like Velázquez, was born in Seville. Unlike his compatriot, Murillo never studied abroad nor became a favorite of the court. Velázquez, however, did give Murillo every encouragement, making possible for him to visit all the royal galleries and introducing him to many foreign painters who visited Spain. He also urged him to go to Italy to study, but the young man never made the trip. Murillo is famous for the two kinds of paintings: his religious pictures, mainly those of young Virgins with the fresh innocence of a girl in her teens, and his paintings of lower-class types, particularly street urchins and peddlers. There were many other painters of the Golden Age: Morales, Sánchez Coello, Ribera, Zurbarán and Alonso Cano are perhaps the best known. In music Spain produced some of the most outstanding composers of the age: Antonio de Cabezón is greatly admired for his superb organ music, Luis de Victoria composed some of the most stirring religious music to come out of Europe. Francisco de Salinas published in 1577 a long theoretical musical work in which several folk tunes were preserved. During the Golden Age, folk songs of every kind and from every region continued to thrive: ballads, work songs, religious tunes, dances, love lyrics, pilgrims’ songs, and many others. Their variety and abundance undoubtedly places Spain at the top of all European countries in the field of folk music. The king of all musical instruments in Spain was, of course, the Spanish guitar. In the sixteenth century it was essentially the same instrument that it is today. The Spanish guitar was probably derived from the Roman cithara, of Greco-Assyrian origin, which was brought into Spain around the time of Christ. It is definitely certain that the Latin guitar of medieval Spain gave rise to the modern Spanish guitar. The Moorish guitar had the rounded shape of the lute; its popularity waned after expulsion of the Moors. Although Italian influence was very strong in Spanish sculpture, there is a deep and often tortured realism in the best Spanish pieces which suggest a Semitic root. Polychromed statues abounded in the churches of Spain, and Spanish choir stall and altar pieces (retablos) of beautifully carved wood are among the finest in the world. Many of the Spanish sculptors also produced statues in wood which are unique. They often took the greatest pains to represent teardrops and blood with zealous accuracy. Spanish iron grillwork, which separated the interiors of religious buildings into various chambers, was another field in which the Spaniards excelled. In architecture the Renaissance period brought in the Plateresque, an exquisite fusion of the old and new (Gothic, Moorish, and Italian Renaissance styles, which is said to have been suggested by the decorative art of the silversmiths or plateros). The high Renaissance style became more and more severe, and in El Escorial embodied the somber mood of Philip II. Later still, as a protest against the severity of the sixteenth century, the Baroque and then the ultra-Baroque threw restraint to the winds as architects went wild with flamboyant and overwrought designs, often so thick that it was difficult to locate the columns beneath the decoration. This style reached its peak in Mexico when the great silver mines poured forth their torrent of wealth, and miner vied with miner to see who could build the most beautiful temple to God.